Check out the following mineral specimens on this page: Fluorite, Smithsonite, Calcite, Fluorapophyllite & Stilbite, Vanadinite on Barite, Pyrite Crystals with Arsenopyrite & Quartz, Chrysocolla on Drusy Quartz, Cuprian Adamite on Limonite, Siderite, Pyrite with Sphalerite, Quartz Crystals with Fuchsite, Skeletal "Window Quartz" with Clay Inclusions, Gypsum Crystal Cluster, Hematinic Quartz, Quartz var. Amethyst, Fluorite Crystals on Quartz with Calcite, Barite Crystals with Quartz, Quartzwith Ilvaite, Cassiderite with Quartz, Pyromorphite, Wulfenite, Siderite ps. after Calcite and Rosasite. Beautiful, light purple Fluorite cluster from the famous Elmwood Mine. In fine condition. Very nice specimen of botryoidal, light green Smithsonite with a beautiful satiny luster. In very good condition. 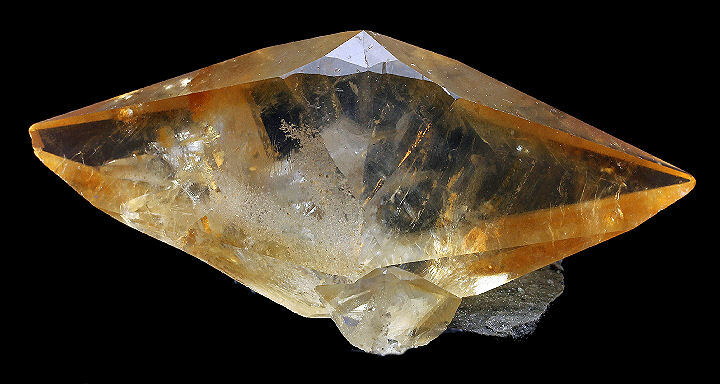 Gemmy, deep golden, doubly terminated Calcite crystal perched on a small piece of matrix. This is a lovely crystal, with two perfect tips and barely a contact anywhere along is highly lustrous, glassy surfaces. The crystal faces are well striated with good transparency of the interior. Very aesthetic display of gemmy, sharp, green Fluorapophyllite crystals scattered among creamy white Stilbites. In very good condition. A very colorful specimen of blood red, lustrous, hexagonal crystals of Vanadinite aesthetically arranged on a nicely contrasting matrix of white Barite. In pristine condition. 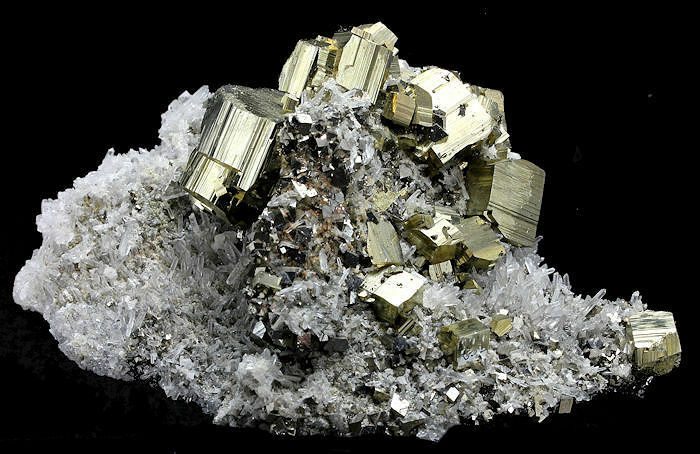 Lustrous, striated Pyrite crystals on a plate of glassy Quartz crystals & Minor Arsenopyrite. In very good condition. Nice formation of Quartz crystals with light green tinting of the tips due to inclusions of Ajoite. In good condition. A rarely seen specimen of "Mud Quartz" from an unlikely locality at Charcas. The piece has beautiful skeletal faces, often called "Window Quartz" or "Fenster." Only a few of this specific habit have come from Chacas. It has razor sharp faces with high luster and good geminess (hard to photograph). The most attractive aspect is the golden clay inclusions, which give the piece a distinctive two-toned appearance. The display side is essentially pristine and is only contacted on the back side. Beautiful and rare for the locality. Even better in person. A rare, striking and colorful large matrix Gypsum specimen from an obscure locality. Textbook, terminated, water-clear crystals, to 4.5 cm, are aesthetically clustered on this piece, with some of the blades having an alluring, burnt-orange colored band. The back blades are attached to the orange iron oxide-tinted Gypsum (Alabaster) matrix, which causes the striking orange color. A beautiful cluster of gemmy glassy Calcite crystals from the Egremont Iron Mining Area of West Cumbria of England. In Fine condition. Beautifully sparkling blood red colored Hematinic Quartz crystals. In good condition. Nice plate of lustrous, moderately translucent Calcite crystals. In very good condition. Gemmy, golden Fluorite crystal cluster with Calcite from the famous Moscona Mine. In good condition. Pink to light purple botryoidal Smithsonite on matrix. In good condition. Complex Quartz crystal cluster attached to a formation of light golden Pyrite with Sphalerite. In very good condition. Highly translucent Quartz crystals with Ilvaite on matrix. In good condition. A dramatic large Calcite specimen from the famous Ohio Quarry. It has a striking dense spray of glassy, translucent, two-toned brown dogtooth Calcite prisms aesthetically set on a limestone matrix plate covered with smaller Calcites. The Calcites reach about 6.3 cm. This exceptional 360-degree cluster is very nearly pristine, with only a few barely noticable gently bruised terminations, which is outstanding for such a large specimen. Superb specimen of highly lustrous, twinned, light chocolate brown amber Cassiterite crystals with Quartz. The Cassiterite crystals are more translucent to gemmy than common. Very fine condition. A superb and rare old-time Siderite specimen with intergrown, large, lustrous, slightly translucent, brownish olive-green, compound rhombs creating a very aesthetic presentation. The impressive large rhomb measures 4.5 cm on the diagonal. In pristine condition. Well crystallized Siderite specimens are rare from this historic Au-Ag-Fe-Sb mining district known since the Middle Ages (around 1200) until the late 1900's. The mines are now extinct. Excellent specimen of lustrous, light golden Pyrite crystals adorned with well formed, jet black Sphalerite crystals from a recent find in Peru. In fine conditiion. Not your run of the mill Pyrite specimen. Attractive powder blue Rosasite crystals on matrix. In very good condition. Fine specimen of light tan Siderite, which has replaced rhomboidal Calcite crystals. In very good comdition. Highly gemmy cluster of light green Fluorite crystals. In very good condition. Nice example of a "Desert Rose" or Selenite included with sand, giving it a unique coloration. In very good condition. Wonderful specimen of highly lustrous, bi-colored, aesthetically formed Wulfenite crystals from the San Francisco Mine. In fine condition. A sparkling cluster of Barite crystals with a sugar-like coating of microcrystalline Quartz. In good condition. Pretty Amethyst crystals bursting out from a contrasting white Calcite covered matrix. In good condition. Sparkling, light blue Chrysocolla on Drusy Quartz in a shallow vug. In very good condition. Very gemmy, twin crystal of Calcite on a piece of Dolostone with a small sidecar Calcite crystal from the famous Elmwood Mine. In very good condition.. Aesthetic sprays of various sizes of lustrous, apple green Pyromorphite prisms filling a shallow vug in a brecciated matrix. A fine and rich specimen from the famous Daoping Mine.